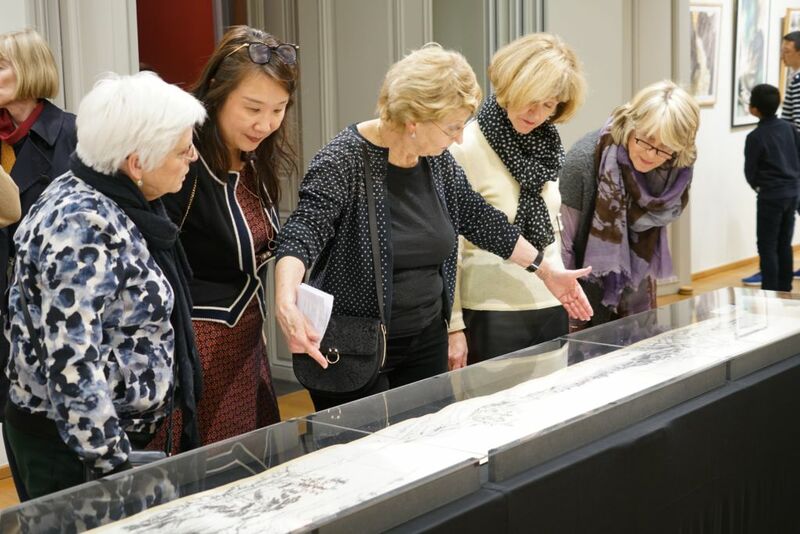 From March 19th until April 13th, 2018, the China Cultural Center in Brussels is hosting the exhibition “Chinese Ink and its Journey to the West”, symbolizing the strong relation between China and Europe. 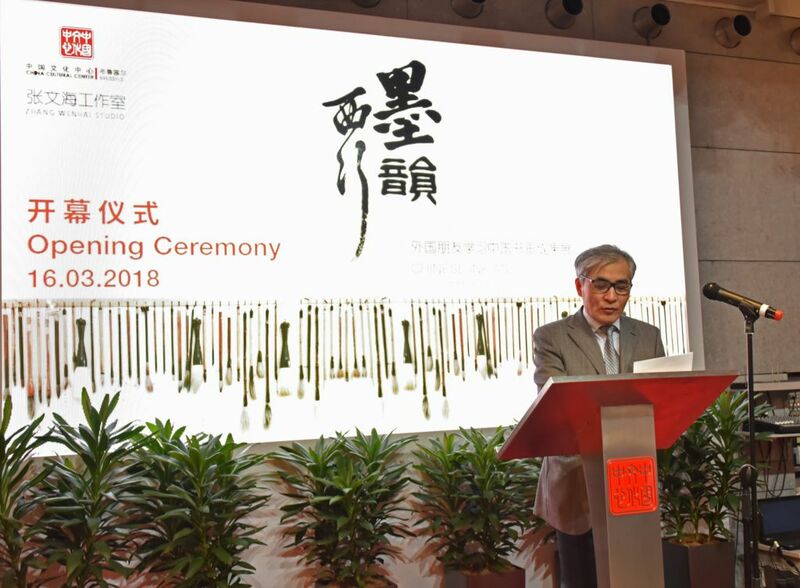 On this occasion, an official opening ceremony was held at the Center on March 16th, 2018. The event gathered many visitors as well as many prestigious guests, who gladly merged with Chinese culture for the evening. 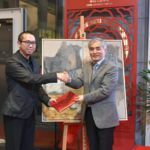 It was with high interest that around 150 guests attended the official inauguration of the exhibition “Chinese Ink and its Journey to the West” on March 16th. The artworks exposed at the Center displayed various themes, featuring the ink-and-wash technique, figures, flowers and birds, animals and many more. Each of these pieces was realized by Mr. ZHANG Wenhai’s European students, all having different backgrounds, origins and ages which symbolize the rich and vivid intercultural exchanges between the East and the West. 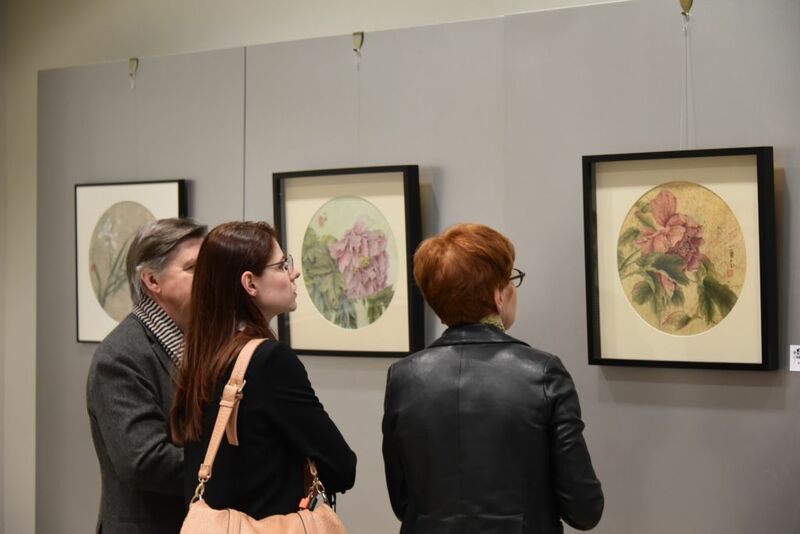 On this occasion, the China Cultural Center was delighted to welcome Mr. ZHANG Wenhai and his European students to display their work, allowing the public to enter their universe. 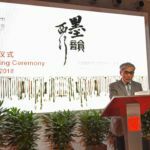 Prestigious guests honoured the Center with their presence, such as Mr. LI Jianmin and Mr. ZHANG Wenhai, the artist himself. The opening ceremony started with a welcoming speech by Mr. TAN Shu, Director of the China Cultural Center, who sincerely congratulated the master ZHANG Wenhai and his European students for their beautiful work. 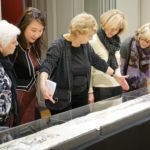 Then, he said: “Today, it is with real delight that we witness the public showing of our European friends’ artistic work, together with Chinese culture lovers coming from across Europe, and to share the fruits that Zhang Wenhai’s students have harvested after years of studying Chinese calligraphy and painting.” The Director continued by encouraging the foreign friends “to retain their passion for Chinese culture and their determination to achieve success” and wishing a lot of success to the exhibition. As the Director put it, “civilizations have become richer and more colorful with exchanges and mutual learning”. The Director was followed by Mr. LI Jianmin, Minister-Counsellor of the Mission of China to the European Union, who encouraged the happening of such exhibitions, because “they allow the people to enjoy the viewing and the feelings from heart to heart both at the same time”. “Such events represent great occasions to share impressive stories”, he concluded. 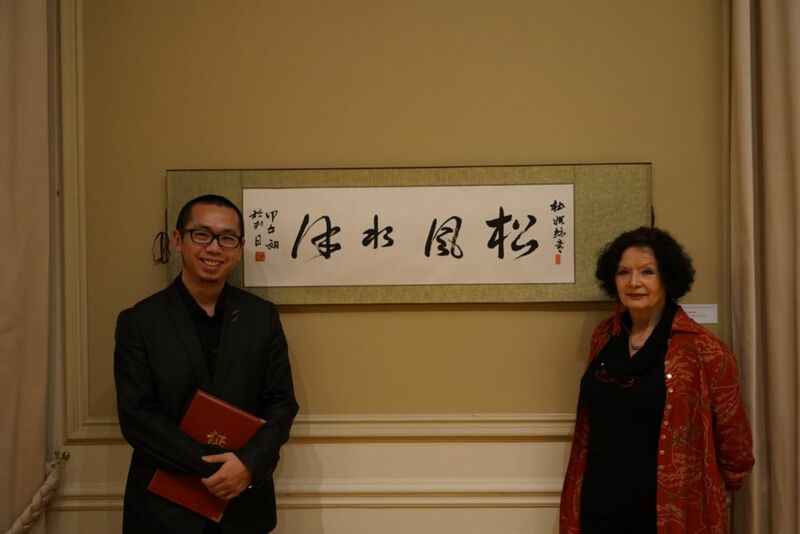 Mrs. Thérèse Zaremba-Martin, a representative selected among ZHANG Wenhai’s students, carried on with a short speech, expressing her gratitude towards the master on behalf of all his students. 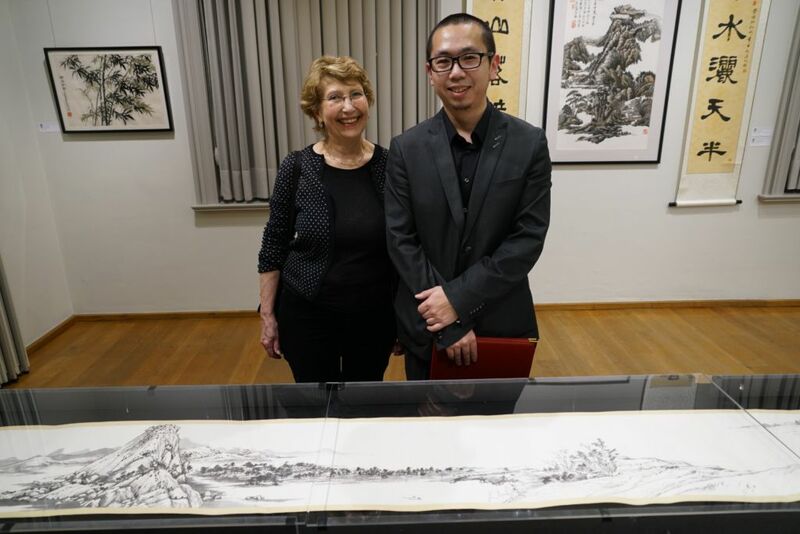 “I was looking for dimension in my art, and he opened the doors to the world of Chinese painting and calligraphy, helping us understand the signs of this art through open exchanges”, she continued. This French-Belgian lady has known the master for seven years already, and is among the first students to have joined the classes. 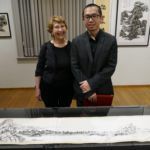 After three full years of work and patience, she has been successful in copying one of the masterpieces of Chinese paintings, Dwelling in the Fuchun Mountains. This type of art is one of the most difficult, because it requires a deep knowledge of philosophy and Buddhism, which Mrs. Zaremba-Martin did perfectly understand and deliver in her painting. Mr. ZHANG Wenhai guided her through that journey, figuratively and literally when he travelled with her from Belgium to China in order to discover the small village related to the Fuchun Mountain. 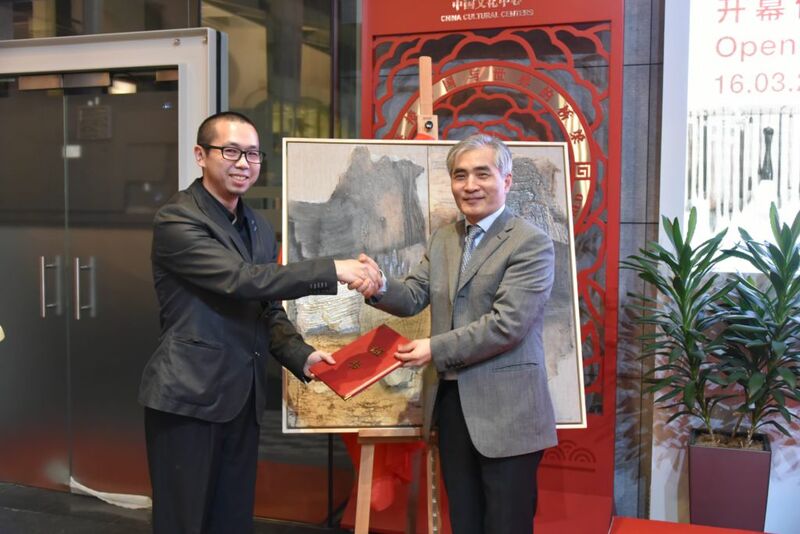 The opening ceremony was closed with the donation of ZHANG Wenhai’s painting “Memory of places (迁土)” to the China Cultural Center in Brussels. This painting has a very personal value for the artist because it depicts his different perceptions of China before and after his journey to Belgium, through a very developed art technique. Through this artwork, he wants to express how the human memory can be influenced by different factors, such as age and culture. 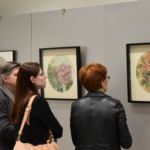 The ceremony was followed by a reception, allowing the guests to share their impressions of the masterpieces accompanied with some food and drinks. The students were present, and shared their views with the public. For many of them, these practices are very relaxing because of the close link with Buddhism and other philosophies. The complex techniques accompanied by precise and delicate gestures form a very interesting and unique mixture loved by the students. In Chinese art, not a detail is left aside, and every line has a meaning. It is because the master can explain these notions so well that the students can achieve greater success and keep their interest for this type of art. 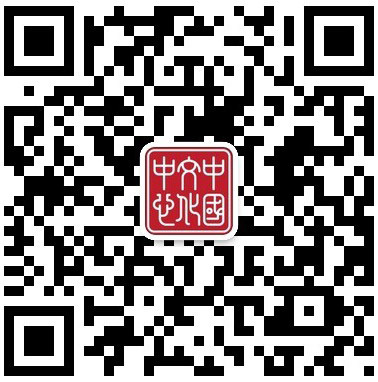 The public unanimously agreed on one thought: the goal of Mr. ZHANG Wenhai and his students to share the Chinese culture through their art is accomplished and the feelings transmitted through their pieces of art are very powerful. With a lot of curiosity, the guests wandered around the Center, travelling through time and culture while admiring the exhibition. 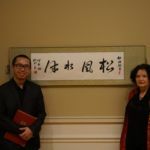 ZHANG Wenhai and Mrs. Zaremba-Martin were invited on the famous belgian radio “Pure FM” in order to talk about their art and the exhibition currently at the CCC !